From Goodreads: "For eight year old orphan, Alexander Hawk, the question, "Is there other Intelligent life in the Universe?" has been answered with a resounding YES! Plucked from a correctional facility for boys because of a test he never even finished, Alexander is sent to train for combat against an alien race of Alligators which is attacking another group of aliens, the Macktonics, who have allied with United States in return for advanced technology. The United States' gathers an army of children so they will arrive at the perfect age for fighting. Alexander faces grueling training exercises as he struggles to rise to the challenge of preparing to save the placid Macktonic alien civilization from pending attack. Before his training is complete he comes face to face with the enemy. Alexander becomes student and teacher as they square off against a superior aggressor. Traveling through time portals crossing time and space to gain intelligence, and ultimately to hunt down their foe before they attack the Macktonics." Let me start by saying thank you to Thomas Wilson for supplying me with an ecopy of his book. This in no way impacts my review. All opinions are my own. No Rules of Engagement isn't like any book I have read before. This is the first book I have read that revolved around aliens. I wasn't too sure that this book would be for me as I am more of a paranormal fan. For the most part I was right, this book is a little bit far out of my favourite genre's but it was still an enjoyable read. Alexander Hawk is an 8 year old orphan who has been recruited for a special government program. He will be sent into space for a 6 year trip to fight an army of aliens (the Alligators) of unknown size and unknown strength. In the 6 years leading up to their arrival they will train and train and train. They are allied with another alien species, the Macktonics, who are far more advanced technologically than humans. They have discovered the secret to time travel. This is how they know that the Gators will eventually attack the Macktonics and take over their worlds. To avoid this the Macktonics allied with the United States, as they needed an army filled with people who know violence. In return the United States have been promised that they will remain the worlds superior power for the next century. My first thought when reading this book was, "Alexander is 8!? Why so young?!!" Later I found out that it was because they would be travelling for 6 years and would be at their fighting prime by the time of their arrival. Still that only leave his at 14 years old. Though he is the youngest on the ship, everyone else started out 10, on arrival 16. So at 8/10 years old these kids were taken from orphanages around the US to train to fight this alien army. Though it does make sense that by the time they reach their destination the kids will be 16 (or 14 in Alexander's case), I still thought that this was way to young for kids to be actively training for combat situations. I just couldn't seem to get passed the fact that he started out being 8. The man in charge of the operation is General Deke Harrbinger. Who was arrogant, rude and hot headed. Which I suppose he would have to be to see it as a-okay to train 10 year old kids in combat! At the start of this book there is a chapter when he picks Alexander up from the orphanage and is really rough with him, which made me seriously not like him as a character. Though throughout the book he did calm down a lot and he did grow on me as he grew as a character. Eventually he realised that Alexander was smart. Smart enough to see flaws where he hadn't. Age aside I did like Alexander as a character (I kind of chose to ignore that he was starting out 8 years old though). Again though, he did grow on me throughout the story. At the start he was incredibly violent (even slamming General Harrbinger's hand in the car door - ouch!) He was the youngest of the kids but he was also the best. The kids would train in a very advanced and high tech simulator that simulated situations of war. This I liked. The kids were able to play out different situations and tactics without actually dying, though the simulation did cause them to feel if they came into forms of impact. Alexander liked to show his superiority by intimidating the people who were condescending or thought they were better than him. He did this through violence, which I found similar to Deke. I don't remember what age he was but at one point he breaks someones finger to prove that he is superior. I know this fits with his character but it was still very unsettling. Thomas has taken modern day America and mixed it with an alien life force, creating a world that is very intriguing. During the first couple of chapters the pace seemed a little bit off, but as the story started taking shape this improved. There is room for improvement here and there, but Wilson has created a very appealing story. So if this sounds up your ally, check it out! Thank You for the glowing review, I am very glad you did enjoy it even though it wasn't you normal read. Let me clear up one fact, Colonel Boar broke the programmers finger they kidnapped. Alexander broke Boar's finger. Yes, it was disturbing, but how do you get the attention of a sadist who breaks peoples fingers, fairly? Break one of his. I thought it was a violent form of poetic justice. You should see what Alexander does to him in the sequel! Thank You again for the review. Let me know if you would be interested in the sequel sometime in 2012 when it is published. Currently still on the rough draft about Chapter 14. Have a Happy and Successful New Year!! Thomas Wilson Author of NROE! 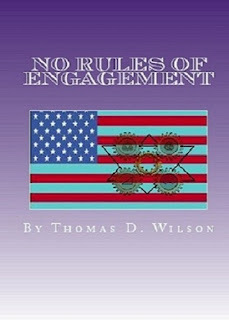 @Thomas Wilson Thank you for allowing me to review your book! I'm not sure I will be able to handle what Alexander does to him in the sequel! I'm a bit squirmy when it comes to sadists! Thank you and I wish you a happy and successful new year also!! Great review Amy! I haven't heard of this one before. Aliens are the new Vampires!! haha. Seriously - you have to check out Obsidian!